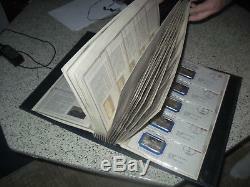 Includes original display book and original envelopes and stamps. I don't know if any of the stamps are rare/valuable but even if not they are interesting and range from 8 cent stamps to 18 cent stamps. In commemoration of the 200. Anniversary of the American Revolution, The Bicentennial Council of the thirteen original states presented these official Bicentennial ingots. 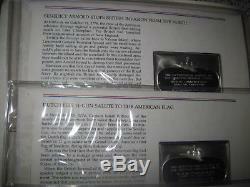 Franklin Mint Issues: These are a series of 70 Bicentennial-themed sterling silver. 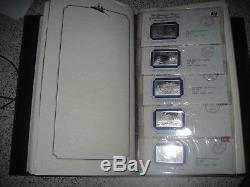 925 fine ingots, each packaged in a postmarked cachet, or envelope, with a total mintage of 19,312. The ingots were originally issued from 1973 to 1981. A person would subscribe, then as each one was issued, it would be addressed and affixed with a postmark based on the date of the ingots historical significance. For example, the cachet containing the ingot commemorating the signing of the Declaration of Independence was postmarked July 4, 1976. Collection cover has scuffs and is worn. However, the silver ingots are in great condition! You won't be disappointed. 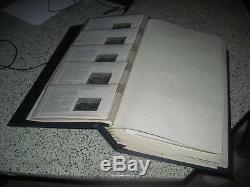 This item is the COMPLETE set 70 of 70. 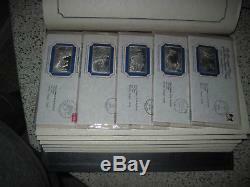 First edition sterling proof ingots. The ingots measure 36.7mm x 58.9mm x 3.1mm. Weight is about 57.8 grams per ingot. #1 Issued December 16, 1973 -Boston, Massachusetts. The Boston Tea Party Ignites thestruggle for the American Independence. #2 Issued January 30, 1974 - London, England. England removes Bejamin Franklin as Deputy Postmaster General. #3 Issued May 11, 1974 - Boston, Massachusetts. England avenges the Boston Tea Partyby closing the port of Boston. #4 Issued may 20, 1974 - London, England. England attempts to control the government of Massachusetts. #5 Issued June 22, 1974 - Quebec, Canada. Quebec act suppresses the colonies'growth westward. #6 Issued September 5, 1974 -Philadelphia, Pennsylvania. First Continental Congress unites the colonies. #7 Issued October 19, 1974 -Annapolis, Maryland. #8 Issued December 14, 1974 - NewCastle, New Hampshire. Patriots attack Fort William and Mary. #9 Issued March 23, 1975 - Richmond, Virginia. Give me liberty or give me Death! #10 Issued April 18, 1975 - Boston, Massachusetts. British troops march as Paul Reveresounds the alert. #11 Issued April 19, 1975 -Lexington, Massachusetts. Encounter at Lexington showscolonists are ready to resist. #12 Issued April 19, 1975 - Concord, Massachusett. The Shot heard round the world changes the course of history. #13 Issued May 10, 1975 -Ticonderoga, New York. The Green Mountain Boys capture FortTiconderoga. #14 Issued June 17, 1975 -Charlestown, Massachusetts. The Battle of Bunker Hill high pricefor victory. #15 Issued July 3, 1975 - Cambridge, Massachusetts. Washington takes command of theContinental Army. #16 Issued August 14, 1975 - London, England. The Colonies make a final plea forpeace. #17 Issued November 29, 1975 -Philadelphia, Pennsylvania. Congress forms the committee ofsecret correspondence. #18 Issued Decemeber 31, 1975 -Quebec, Canada. The Quebec campaign diverts Britishstrength to Canada. #19 Issued January 1, 1976 -Somerville, Massachusetts. Continental colors symbolize thecolonies' unified strength. #20 Issued January 5, 1976 - Exeter, New Hampshire. New Hampshire becomes an independentcolony. #21 Issued January 10, 1976 -Philadelphia, Pennsylvania. Thomas Paine asserts the colonies'right for independence. #22 Issued February 27, 1976 CurrieNorth Carolina. Fighting Spreads to the South. #23 Issued March 17, 1976 - Boston, Massachusetts. British Forced to Evacuate Boston. #24 Issued April 12, 1976 HalifaxNorth Carolina. North Carolina leads the struggle ofindependence. #25 Issued June 11, 1976 Philadelphia, Pennsylvania. Committee Formed to Draft theDeclaration of Independence. #26 Issued June 28, 1976 Charleston, South Carolina. British Attack Repulsed atCharleston, South Carolina. #27 Issued July 2, 1976 Dover, Delaware. Caesar Rodney Casts the DecidingVote for Independence. #28 Issued July 4, 1976 - Philadelphia, Pennsylvania. #29 August 30, 1976 Brooklyn NY. Washington's Withdrawals SavesContinental Army. #30 September 22 1976 New York NY. The Execution of Nathan Hale. #31 October 11, 1976 Plattsburgh NY. Benedict Arnold Stops BritishInvasion from the North. #32 November 16, 1976 NetherlandsAntilles. Dutch Fire 11-Gun Salute to theAmerican Flag. #33 December 20, 1976 Baltimore, Maryland. Congress Convenes in Baltimore, Maryland. #34 December 26, 1976 Trenton NJ. #35 December 28, 1976 Paris France. #36 January 3, 1977 Princeton NJ. #37 June 14, 1977 Philadelphia PA. Congress Adopts the Stars andStripes. #38 July 27, 1977 Fort Edward NY. The Scalping of Jane McCrea. #39 August 01, 1977 Philadelphia, Pennsylvania. #40 August 16, 1977 Bennington VT. #41 September 11, 1977 Chadds Ford, Pennsylvania. #42 October 4, 1977 Philadelphia PA. #43 October 17, 1977 SchuylervilleNY. #44 November 15, 1977 York PA. #45 December 19, 1977 Valley ForgePA. #46 FEBRUARY 6, 1978 - PARIS, FRANCE. #47 February 23, 1978 Valley ForgePA. VON STEUBENJOINS WASHINGTON AT VALLEY FORGE. #48 May 4, 1978 York PA. #49 June 28, 1978 Freehold NJ. #50 August 29, 1978 Newport RI. #51 December 29, 1978 Savannah GA.
#52 February 25, 1979 Vincennes IN. #53 March 3, 1979 Sylvania, Georgia. #54 July 16, 1979 Stony point, NewYork. #55 August 14, 1979 Philadelphia PA. #56 August 22, 1979 Athens, Pennsylvania. #57 September 23, 1979 Flamborough, England. #58 October 9, 1979 Savannah Georgia. #59 February 2, 1979 Moscow, USSR. #60 May 12, 1980 Charleston, South Carolina. #61 July 10, 1980 Newport, Rhode Island. #62 August 16, 1980 Camden, South Carolina. #63 September 23, 1980 Tappan, New York. #64 October 7, 1980 Kings Mountain, North Carolina. #65 January 17, 1981 Cowpens, SouthCarolina. #66 March 15, 1981 Greensboro, NorthCarolina. #67 September 5, 1981 Yorktown, Virginia. #68 September 6, 1981 Groton, Connecticut. #69 September 8, 1981 Butawville, South Carolina. #70 October 19, 1981 Yorktown, Virginia. 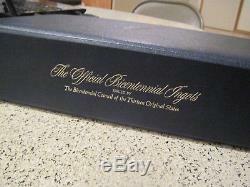 The item "Franklin Mint Official Bicentennial Ingots Full Set of 70 Silver Ingots" is in sale since Thursday, September 13, 2018. This item is in the category "Collectibles\Decorative Collectibles\Decorative Collectible Brands\Franklin Mint\Other Franklin Mint". 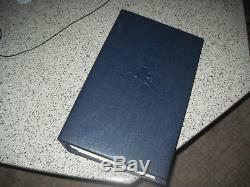 The seller is "andrehoffma3" and is located in Hood River, Oregon. This item can be shipped to United States.